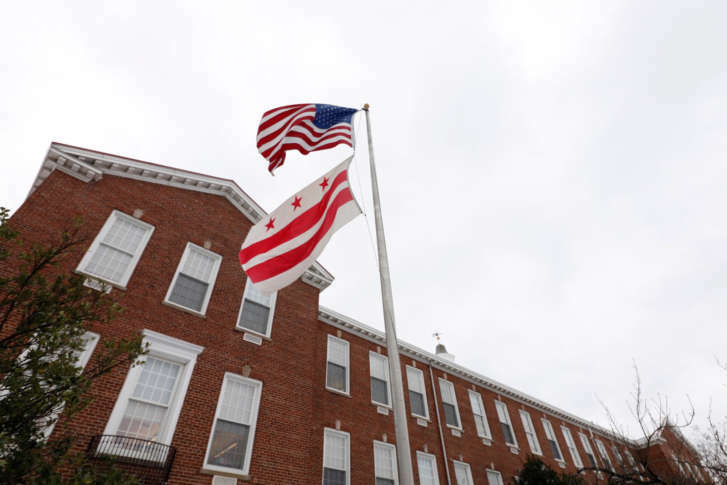 D.C. Public Schools' decision to open two hours late on Tuesday met with negative reactions on social media, but parents at an elementary school in Tenleytown took the decision in stride. WASHINGTON — D.C. Public Schools’ decision to open two hours late on Tuesday met with negative reactions on social media. But at Janney Elementary School in Tenleytown, parents were philosophical about the decision. Lines of SUVs pulled up outside the front of the school on 43rd Street Northwest while parent volunteers assisted getting children laden with backpacks across the slushy street. Addie Adelekan, with her children Larry and Lola, said the decision to open came as a surprise. “For a second, I was a little bummed.” But then, she said, she figured her kids would have a chance to play in the snow with their friends. She drove them to school, and said the roads were slushy, but not bad. “I lived in Sweden, so this is a piece of cake,” Adelekan said, laughing. Neal Edwards and Lynn Keuchenberg were also a bit taken aback by the decision by DCPS to open two hours late. “We were about the only system open between Richmond and Boston, I think!” said Edwards. Kuechenberg said they live close enough to walk their child to school. “We were fine. Now, people who commute by bus and by Metro, they would have had a little tougher time than we did,” she said. District school officials decided to excuse any student absences, which may have relieved some students and parents. But generated plenty of reaction on Twitter. D.C. received between 2 and 3 inches of snow from the storm, according to National Weather Service reports. Anne Arundel County schools also opened late instead of closing. But most school systems in the region closed on Tuesday.